This neighborhood park in East Boston, which is tucked between a public pool and community center and therefore gets constant use, was in desperate need of updating. The major concern expressed in multiple community meetings was safety. CBA responded to these concerns by using visually transparent play equipment and reorienting the basketball court to increase sight lines. Stars and planets became the theme for the park - the water play area has a solar system theme and bright yellow stars adorn the front decorative fence. 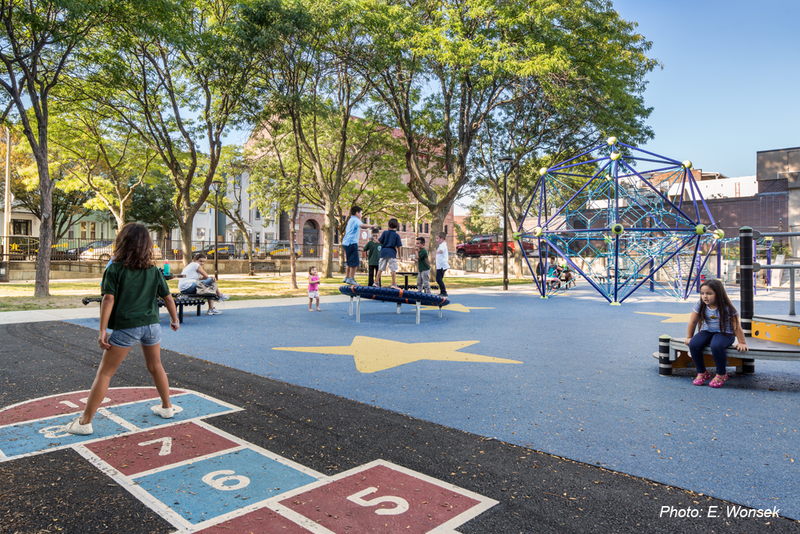 The design reflects CBA's focus on sustainability, incorporating a deck pathway to protect the roots of a grove of existing shade trees, solar powered USB charging benches, LED site lighting, and low water use spray features in the splash pad.